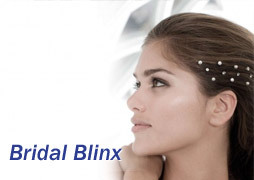 Jupon supply a wide range of bridal headpieces to really enhance the brides beauty on her special day. We keep a stock of all items at all times in a variety of colours. Click any of the products below for more information. 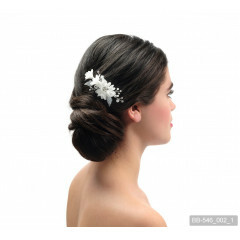 This stunning hair comb, from Jupon, rest comfortably on the brides hair. 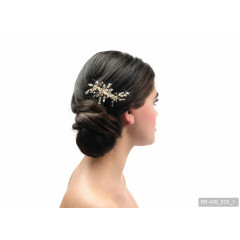 It's attached on a lightweight comb and is finished off with a flower and Strass stone design. Available in Champagne. 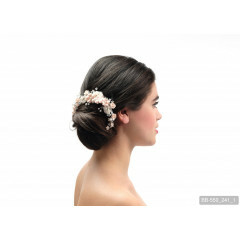 ..
A stunning hair comb from Jupon featuring a large floral pattern that spans around the top of the brides hair. The design features shimmering Strass stones and glass crystals that really stand out. 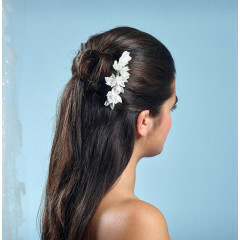 Available in Ivor..
A stylish bridal hair corsage from Jupon. This features a large floral centrepiece with a pearl and Strass stones inlay. Available in Rose. ..
Jupon presents this lovely bridal hair corsage. This item features 3 floral shapes adorned with pearls and Strass stones. Available in Rose. 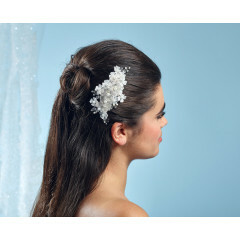 ..
Jupon presents this stunning bridal hair corsage. This bridal headpiece features a floral line and is finished off wonderfully with Strass stones and pearls. Available in Rose. 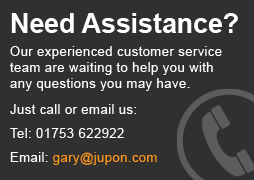 ..
A stylish and lightweight hair corsage from Jupon. This wonderful piece features a thin base with pearls and Strass stones as the feature. Available in Gold. 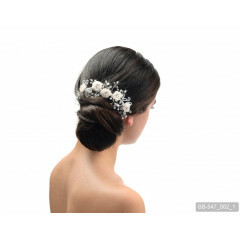 ..
Jupon brings you this attractive floral style hair corsage. The main feature is lace netting and it's adorned with pearls and Strass stones. Available in Pink and Ivory. ..
Jupon brings you this lovely hair corsage with flowers and Strass stones, on a silver base. Available in Ivory. ..
A large floral style headpiece from Jupon. This features a cluster of white flowers as the main focal point, with netting that hangs down. Available in Ivory / Pink. ..
A small headpiece from Jupon with a design made up of soft flowers. Available in Ivory. ..
A small floral headpiece from Jupon featuring white pearls and strass stones, sat on a base of lace flowers. Available in Ivory. ..
A small floral headpiece from Jupon featuring white pearls and lace netting flowers as the main design. Available in Ivory. ..
A stunning headpiece from Jupon with a transparent band and a large floral design as the centre piece. Finished off wonderfully with Strass stones. Available in Pink. 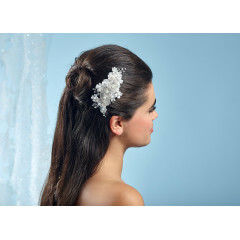 ..
A Vintage style hair corsage from Jupon featuring a lace flower design with Strass stones and beads. Available in Ivory. ..
A double flower headpiece from Jupon with a ruffled lace base and a netting finish. This item also features studded crystal sequins. Available in Ivory / Blush. ..